What are some remedies to this, and why does it happen? My grip is an forearm length and then a fist more. Should it be wider? When I plant in the box before I turn around and run back, my top fist is directly above my head. Should my hands be lower, with the lower fist at around eye level? It seems like it's impossible to not do the face-plant with the arms so high. Last edited by bushy_12 on Tue Apr 07, 2009 2:50 pm, edited 3 times in total. You will never (never) be able to plant (or swing) properly with a grip that wide. This might be contributing to your problem. Try using a shoulder width grip, about the length of your forearm. See if that helps at all (although you might need some time to get use to it). Would it be easier to bend the pole with a wider grip though? It's easier to block out... So I guess you could make that argument if you really wanted to, but then the other side says that it is easier to swing with a narrower grip, so I guess it's neutral. But the point of this sport isn't bending a pole... It's using it to jump high! Stiff polers slid their hands together during their take-off because it's easier to swing like that! On a flexible pole that's not realistic because you have no balance, which was not a real issue for steel vaulters. 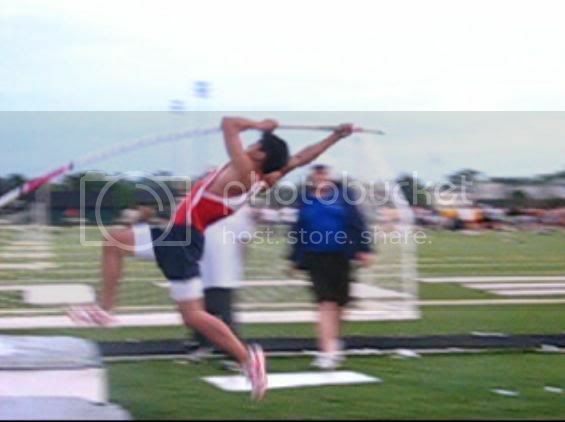 The pole should bend as a result of the inertia of the vaulter, not because of a bottom arm/wider grip/whatever. O, I re-read what I wrote, and I meant one forearm and a fist, not a whole arm. Well, do try narrowing it up a little bit... You should use just about as narrow a grip as you can get away with on the pole sizes you use. Another possible reason is the nature of your take-off... I'm guessing it is under quite often, no? But I bet your top arm doesn't work much on the ground... As in your pole is in the back of the box while you're still quite firmly on the ground, but then you keep the pole unbent by letting your top hand come back? Does that sound accurate? 1. The longer the pole, the narrower the hand grip? 2. Yea, I presume my top hand doesn't do a lot of work. What should it be doing? As for your second question... Your top arm should be doing nothing except pushing the pole UP vigorously. In saying that it 'didn't do much' I was trying to diagnose your problem, not give you a prescription! You will fix this problem if you take off FREE! Strive for a 'pre-jump' or to be 'out' by 3-4 inches (with your top hand straight up over your head). Your pole should not have yet hit the back of the box when you leave the ground. 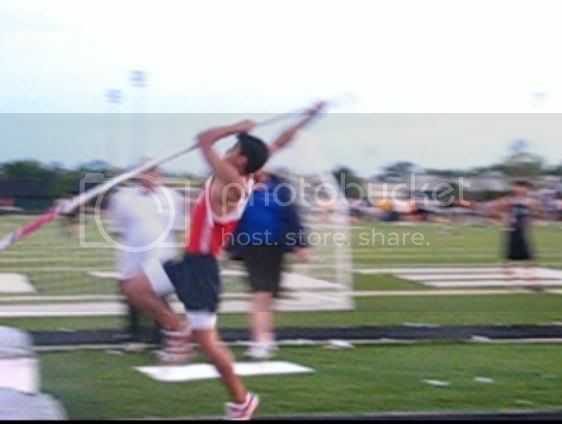 Try this with a stiff pole from 1-2 lefts for one practice (maybe 100-150 reps? ), then move back to 3 for your next practice. Then start taking it further and further back and mixing in a flexible pole until you are back at your full run. powerplant42 wrote: ... Your top arm should be doing nothing except pushing the pole UP vigorously. All good advice from PP, except I'm worried that this particular quote might be misinterpreted. I think the consensus is ... if you're striving to use the Petrov Model ... that you should "push the pole up vigorously" with BOTH arms as you're jumping into your free takeoff, but once the pole hits the box, you should PUSH and SQUEEZE with the top arm/hand, and then AFTER you've "finished your takeoff" and you've stretched into the C position, you IMMEDIATELY (no pause) start your downswing. The downswing needs to be as fast as possible, and it's fastest when the muscles of the entire body ... from top hand to trail leg toe ... are used to accelerate the downswing into the WHIP position ... as you pass the chord of the pole. From there, your upswing will (IDEALLY - but it's not that easy for beginners/intermediates) just continue your momentum until you swing upside down. 1. Before takeoff, you push it up vigorously. 3. When you start your downswing, your top hand pushes forwards as your chest moves back ... and as your trail leg swings ... all in unison. 4. All the way thru your downswing, whip, and upswing ... until your body is fully extended (IDEALLY) ... you keep your top arm straight (don't hunch your shoulders). Bushy, re your concern about the face-plant into the pole ... don't worry about that! That's not really the problem! As long as you have good posture (meaning good forward lean on takeoff and into your C, with your chest driven forwards and your trail leg back), it doesn't really matter if your face is close to the pole. There's even many vids of Bubka in a similar position ... maybe not as extreme, but probably similar enough that it looks "too close". This only happens for a split second, and then immediately after that, THE POLE WILL BEND away from your face ... because of the momentum of your run/jump ... that you've converted into energy in the pole THRU THE TOP HAND ... not thru the bottom hand. 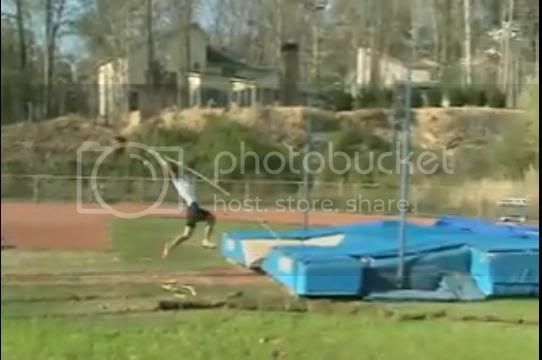 This is probably the #1 misunderstanding that young vaulters have about vaulting ... that they must force the pole to bend with the bottom arm. I had this same misunderstanding when I was in HS. Once you realize that the pole bends due to energy transfer thru the TOP hand, then you can re-focus on the vault parts that are deficient, instead of trying to "fix the face-plant" by a bottom arm push. I was pleased to hear yesterday that VaultPurple discovered during his pole push experiments that even when he missed grabbing the pole altogether with his bottom hand, he STILL bent the pole! Thank you Kirk and Powerplant for your advice and critiques. 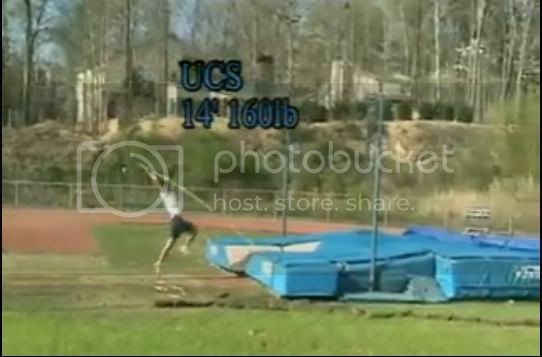 Today at practice, I will try to keep my top hand high as possible during the plant, and keep it straight through out the vault while thinking UP UP UP. your problem has nothing to do with grip distance or any of that. i know because i had the same problem the past 2 years. and its fairly easy to fix. first you have to make sure that you are not planting late. so your arms have to be extended and in position to plant before the pole hits the back of the box. once you've done that, all you have to do is stick out your bottom arm and punch the pole out. its that simple. i found that for me, it was all mental. i THOUGHT there was more to it and i ended up over-complicating a simple problem. and then came one day when i was tired of hitting the same height and i went to practice with a mentality to blow through poles. an easy way to do it: at your plant just look at your bottom arm and make sure its out in front applying pressure. do that for a couple of weeks until your plant just becomes muscle memory and you don't have to think about it anymore. once you get your bottom arm out, its a whole new world. poles you thought were stiff become warm ups. just be wary of that aggressive mentality. you might block your swing if you don't release pressure after your takeoff.